The Trinity, over all other beings shine. And witness many eons of the planet. Free masters of the strings, voice and beat! This bard worships their feet. This is a kriti in which Tyagaraja directly names Nadopasana, worship of music, and describes its power. The kriti seems simple, but there is a lot of subtlety to its lyrics and to its rendition. Today, most of the concepts mentioned in the lyrics, would only be known in Tyagaraja's own hinterland, that too among a select few. In a cross-cultural context, or for those not of "the few", much explanation is needed. Some of this is given here. Shankara as we have seen, means "He who does good". Narayana (patronymic of 'nara' or Man) is an epithet of Vishnu, that interestingly corresponds to "the son of Man", a phrase from elsewhere. Brahma is called "Vidhi" here. The word 'Vidhi' literally means a rule or destiny. When personified, it refers to Brahma, or the creator, because he creates and orders life in the universe i.e. he 'ordains' the destiny of all beings. Further, he is said to be responsible for keeping the four vedas that vest him his authority, and for executing the injunctions or rules ('vidhi' again) in them. Mantra, Yantra and Tantra are the three ways in which mystical power might be used or accessed in Hinduism. Mantra refers to sacred chants. Yantra refers to sacred amulets, tablets, diagrams and plaques with sacred pictures, said to be invested with mystical force. Tantra refers to certain rites (and secret sciences) that allow the performer access to mystic powers. Yantra and Tantra are particularly esoteric in modern Hinduism, and are no longer widely sought as attainments. Modern Hindus mostly adhere to the more philosophical and less mystical schools of devotion, such as Vedanta. Manvantara: To understand the concept of Manvantara, we need to know the Hindu time scale. The Hindu time scale is astronomical. One of the most common scales from the Srimad Bhagavatam, is given here. The internal details and the numbers might differ in other versions. There are four ages of men or yugas, starting with the Satya, followed by Treta, Dwapara and Kali. Each of the succeeding ages is diminished by an extra quarter in length from the first. The Satya yuga is 1, 728,000 years long. The Kali yuga, the age we live in, is 432,000 years long and about 6000 years have lapsed since its onset. The four yugas correspond to the Golden, Silver, Bronze and Iron ages, and in each succeeding age, Dharma or righteousness diminishes by a quarter. The Satya yuga was when all mankind was pure; in the Kali, less than a quarter is. A cycle of these four ages is said to be a Mahayuga or a Great Age. A thousand cycles or Mahayugas, is said to make up a Kalpa or cosmic day. A Kalpa makes for a day in the life of Brahma, the creator. At the end of the Kalpa, there comes the Pralaya literally 'Deluge' or 'Dissolution', in which all creation is destroyed, and Brahma sleeps. A Pralaya or cosmic night is of the same length as a Kalpa. A Kalpa or a Pralaya is about 4.3 billion years long. When Brahma wakes up, another Kalpa starts and there is new life and new creation. Fourteen Manvantaras make up each Kalpa. Each Manvantara has a unique Manu or progenitor. Manvantara literally means "the interval between two Manus or progenitors" or "the period of a Manu". Each Manvantara consists of 71 yugas. Each Manu is said to repopulate the world and preside over the life of his time. In a Pralaya or Dissolution, life still exists in the heavens. For example, the first incarnation of Vishnu, the Matsyavatara or the Great Fish incarnation, which is the Hindu 'flood legend', mostly happens during a cosmic night as He delivers a Manu, across the floods of the deluge, to the new age. Brahma is more a post than a unique person. Different personages have been Brahmas in the different ages. The Brahma of this age is said to be Hiranyagarbha, or "he born of the golden egg" (literally 'golden fetus'), signifying rejuvenation. In their daily rites, each Hindu is required to identify to the gods, the temporal and spatial coordinates in which they offer their propitiation. The latter include identifying the continent, reckoning from the holy Mount Meru, the city, the river or temple tank, the temple and the temple spire by which they are then situated. The former include identifying the time of day, the star, the waxing or waning phase of the moon, season and so on, culminating in identifying the Manvantara and the Kalpa and so the present Manvantara is Vaivasvata, named after Vaivasvata Manu, a progenitor, and the Kalpa is Shwetavaraha or the Kalpa of the "white boar". This is said to be the seventh Manvantara of the present Kalpa. Although there is rich mythology and a superabundance of aspects of daily worship, note that in their most pristine (and esoteric) forms, Hindu philosophy and religious practice focus purely on realizing Brahman or the one Supreme Self. Cf. The concept of Kalpa and Pralaya with the now well known cyclic universal singularities, the Big Bang and the Big Crunch. Due to the connection of a Manvantara with repopulation, in the verses, I have tied it to a geological "eon of the planet", in each of which a new kind of life-form seems to emerge and dominate the earth. Tantri refers to any stringed instrument, generally the veena and 'laya' refers to percussion. A santoor was for instance called, a "Shata Tantri Veena" or 'the lute of a hundred strings'. Tyagaraja is describing experts of the various elements of music such as voice, melody and beat. Svatantra means "independent" or "of free will". Svatantrin, or an autonomous agent, is a loaded word in the religious context. It does not merely refer to independence. It refers to such beings considered outside the orderly heirarchy of the cosmos and the control of preordained Fate. For example, Vishnu's frequent intercession on Earth in His different incarnations or avatars, and changing of the existing order of things, may be explained by His being Svatantra, i.e uncontrolled, or being able to act on free will, or by the "power of free will" alone, and so being able to seemingly tinker with Fate. Sometimes, great monks and sages are also conferred the title of "svantantra" to signify they are autonomous and unattached, such as to a monastery or a religious chair. Lastly, note that in Hindu theology, the source of the power of the Trinity and other gods is said to be the sacred syllable 'OM', and the primordial sound or "nada" that it generates. This primordial sound is said to have led to music too. Hence, the connection made in this kriti. This short kriti is a study in cultural displacement, as mankind scattered across the globe. It contains many parallels to other cultures, such as progenitors, but still engenders a vast amount of explanation to demystify it. 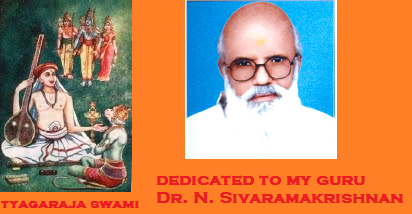 Note that in this site, we capitalize pronominal references to Siva and Vishnu, but not those of Brahma. This is to reflect the status of the former as "great gods" whose daily worship, including in substantiated form, in temples and homes, is permitted. Such worship of Brahma is not permitted. In most of the Puranas and in the epics, he is always subordinate to one of the others. In fact, Brahma is son of Vishnu, having arisen from his navel in a divine lotus. Strictly speaking, Nadopasana should be termed 'worship through music', 'worship by music' or 'music as worship'. I have preferred 'worship of music', employing "of" in the sense of "to speak of something", and certainly don't mean that music alone is worshiped. vedoddhara- Could refer to the Matsyavatara where Vishnu explicitly saved the Vedas. Could also refer to Vedavyasa who compiled the Vedas; or to Brahma himself, as he "executes" the Vedas and so uplifts them. vedatitulu- "He, who is beyond the vedas"- usually refers to Vishnu and sometimes Siva, when considered "great gods". Can also refer to someone who has imbibed all the vedas, such as the seven sages, for having crossed or 'exceeded' the vedas and seen the light. vishwamella nindiyunda varalu- This conveys omnipresence. Could refer to the fifth incarnation of Vishnu when He stretched across the universe in His cosmic form. Could also refer to Siva, from an episode in which He too stretched across the universe in a fiery form. Or a being such as Indra, Agni, Garuda, Agastya, Durvasa etc. who could appear anywhere at will, crossing the universe. So, in a way, the three descriptions could, in order, qualify one of the Trinity. We may thus continue and attribute expertise in music to sage Narada (tantri villolu), and take that "living past eons" could refer to the devas or the seven sages or some such, and conclude that the kriti says such miracles were wrought for so many beings, by the power of worship through music alone. This meaning makes it a more consistent narrative- because there is no need to inconsistently say in the Charanas, that the Trinity is long-lived past the Manvantaras, when the Trinity is said to be eternal. We could infer a consistent descending order of divine beings that match the attributes. It is also not wrong, because the grammar in the kriti, admits to such meanings too. But before "decoding" the lyrics like this, I will however make two comments as a linguist of some part. Tyagaraja was not very precise in his lyrics as some other composers have been. He always prioritized the underlying melody over the lyrics; he used fillers and strange usages in many places. In his new phrase creation, we could see something of a Shakespeare in him. Secondly, two hundred years may have caused an amount of elision and juxtaposition. So, my personal opinion is that, absent a contemporary printing or such first hand sources, any radical interpretation, starting with mine, must be taken with a very large grain of salt. So, we could simply take the reference to eons as a harmless allusion to the Trinity being eternal. He might merely have used manvantara to rhyme with mantra, given that much of the lyrics is indeed rhymed. The other clue is that, only gods could reside in and empower mantra, yantra and tantra. The length of a Kalpa of Cosmic day is about 4.32 billion years, which is not far off from the actual geologic age of the earth of about 4.7 billion years. This is the closest any of the ancient cultures came, to giving a time scale that matched matched the astronomical age. Going further, only one or two Kalpas are known. Given that the age of the universe is about 13-14 billion years by present estimates, there has just been time for 1 Pralaya and 2-3 Kalpas. As a Pralaya follows a Kalpa, so has another final singularity, the Big Crunch been postulated. The 6000 odd years since the onset of Kali ties in with certain other calendars- such as the 4004 B.C. date given by some Christian Chronologies such as Ussher in the 17 century, when Adam and Eve sinned and were cast out of Paradise. Ussher's and other such chronologies are not widely accepted. But, I also think the 420,000 years left in Kali, is too much time for mankind to nuke itself out. Each Manvantara, a new Manu takes over and repopulates the world. There is rejuvenation. Similarly, in the geological time scale, many mass extinctions and subsequent repopulations by newer life forms have been proved. Different kinds of life forms have emerged and dominated the earth in different "eons" in that time scale for example, aquatic life, insects, reptiles and mammals, all have had their period of dominance, culminating in the appearance of Homo Sapiens in the Quarternary period. If we neglect that a Manu is human and populates the world with human life, and consider all life, and that each Manu's reign is fixed, we could see some correspondence with what happens in geology over a 'geologic eon'. The 300 million years a Manu gets doesn't fit too badly with events such K-T extinctions and repopulation by other life-forms over "eons". Flood legends are common in almost all ancient cultures. In some Amerindian and other cultures, it lasts no more than 2 days. In Hindu culture, it lasts the longest- 4.32 billion years. Lastly, Hindu theology describes most geneses and creation, (such as in the Purusha Sukta, Brahma and Prajapati episodes), as being mind-born or being 'willed' into existence. This is not the same as the material and highly specific creation in six days described in the Genesis of the Old Testament. Though certain births and certain specific creations are described, much of this is more the creation of a concept, or a template, than substantiated entities. So, I flatter myself into thinking the mind-born method explicitly allows for evolution to work within the Hindu creator's framework, without making him obsolete! It doesn't seem as black and a white battle as between biblical creationism and evolution have in the United States. Ok, now, let's cease this voyage of fancy, before we fall off the flat earth and wake up :) Thank you all for choosing to travel in our ship, the 'S.S. Speculation'. I think this is the first and last time you will hear me on this site, with my speculative hat on and I will be scrubbing this speculation in a few days.